If Jacqui Smith was looking for a pick-me-up this morning, she should have avoided the newspapers. 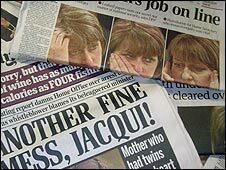 The banner front-page headlines were written to make a minister's blood run cold. Her job was on the line, they said. She was under fire. She was responsible for another fine mess. The reason for the deluge was the news the Conservative frontbencher Damian Green and the civil servant who leaked him documents, Christopher Galley, would not face charges. Jacqui Smith did not write the letter that launched the police investigation and she was not told of Damian Green's arrest until after it had taken place. But she was frustrated and angry about the leaks from her department, and as home secretary she could hardly avoid political pain when a police investigation into those leaks ended without even a day in court. That pain comes after criticism about her expenses claims - Parliament's standards commissioner is investigating her second home allowances. She was forced to pay back money claimed for two adult movies. The sums involved in that case were tiny but the attention it attracted was huge. All that makes her - in the words of another headline - beleaguered. One of her predecessors as home secretary - David Blunkett - said politicians like Ms Smith can suffer from a "snowball" effect, as bad news stories arrived one after another. She is unlikely to slip from the headlines. The Metropolitan Police are yet to publish a report into the arrest of Damian Green and search of his offices. The Standards Commissioner will come to a conclusion about her expenses. And if there is one job that can bring fresh crises with little warning it is that of the home secretary. Yet even the most hostile commentators do not expect her to step down. They speculate she might be moved in a summer reshuffle. This is not a minister who has committed such a gaffe she is expected to vanish in an exchange of resignation letters. Forecasting the outcome of reshuffles is a dangerous game, particularly ones that might or might not occur in the future. But reports of political troubles have a nasty way of becoming self-fulfilling prophecies. When Parliament returns she will face MPs to make a statement about the recent anti-terror arrests. She will do so knowing her performance is under intense scrutiny.